Over time your compost will help to improve the soil structure of your garden, maintain moisture levels, whilst keeping your soil's PH balance under control, whilst eliminating the need to purchase expensive soil conditioners. Compost has everything your plants need to grow vigorously, including phosphorus, nitrogen and potassium. Modern composting bins are generally made from plastic or wood and come in a variety of shapes, sizes and designs, allowing them to be placed in virtually any garden or backyard location. Plastic is relatively inexpensive and is both durable and light and should last for many years. In contrast to plastic, wooden composting bins come in a square or rectangular shape, and if purchased are inclined to come as a self assembly unit. Many diy gardeners will make one to their own design or purchase a simple plan. Variations of composting bins include tumbling composters that have been designed to make aerating and turning compost material easier and the wormery which uses a specific kind of worm to chew through your organic waste converting it into a rich garden compost. The majority of bins on the market will do their job efficiently, although there maybe one or two that stand out and for which you have a preference. The GEOBIN composting system is an excellent choice for the homeowner who wants the very best from his/her garden and is concerned about the environment. It converts organic materials such as grass clippings, leaves, and vegetable scaps into a rich soil conditioner easily and efficiently. 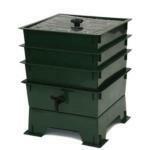 The design of this particular bin allows for quick assembly and is expandable to more than three feet in diameter. 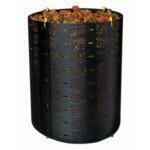 It provides maximum ventilation while maintaining moisture and heat, which speeds up the production of compost. So if you want the very best from your flower and vegetable garden with a nutrient rich conditioner the GEOBIN system is a good choice. 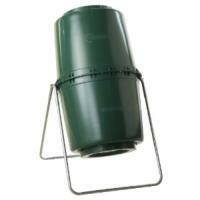 The Tumbleweed compost tumbler is sleek and stylish in design, and is 100% UV protected. It heats up the contents very efficiently which speeds up the breakdown process. By spinning the bin every couple of days it's very easy to create great compost. Supported on a galvanized steel leg base it's a robust unit that won't rust and will provide many years out in the elements. Irrespective of which end is up it's easy to add or remove material due to dual end twist lock lids. This tumbler can hold upto 58 gallons of materials, while at the same time breaking down all of your kitchen waste, garden debris and other compostable materials into rich, organic compost that your plants will appreciate. The worm compost bin or wormery is an extremely efficient way of producing compost, and enables you to turn all of your organic kitchen waste into soil rich with nutrients for your plants and vegetables. Just add worms and your organic kitchen waste to the bottom tray. The worms will then begin to process the food. As soon as the bottom tray is filled with waste add one more tray. The worms move upward to the latest source of food leaving behind the lower tray which is full of nutrient rich compost. By making use of worms to do your composting, you will find that compost is generated considerably quicker than with conventional composting methods.